The youth loungewear pants fail to meet federal flammability standards for children's sleepwear, posing a risk of burn injury to children. No injuries have been reported. This recall involves about 19,000 pairs of youth loungewear pants. The youth loungewear pants came in two prints, one with an allover boxed M&M'S character print and the second with an allover M&M'S candy print. Both are 100% cotton and were sold in sizes small through XL. The recalled garments have a label sewn inside the waistband with the product's identification number. The recalled pants have identification numbers ending in 0711, 0212, 1112, 0313, 0413 or 0713. M&M'S World stores nationwide from 07/2011 - 11/2014 for about $22. 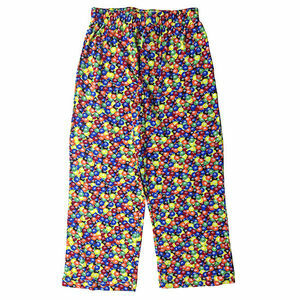 Consumers should immediately take the recalled youth loungewear pants away from children, stop using them, and return them to M&M'S World for a full refund. Customers may also call (800) 681-5187 or visit mmsworld.com for more information. MandM’S World at (800) 681-5187 from 9 a.m. to 5 p.m. ET Monday through Friday or online at www.mmsworld.com and click on the ”Product Recall” link at the bottom of the page for more information.